Ayurveda says "if it good enough to put on your skin then it should be good enough to eat". This is because the skin is the largest organ of absorption and has the capacity to digest, on a microscopic level, nutrients which are applied topically through skin products. If the ingredients you use are nutritive, healthy and natural, the body has a better capacity for optimizing health. If the substances used are not wholesome or natural, then these become toxins to the skin, which the body then absorbs and lowers the vibration of overall health. Contains: turmeric and lime oils in goats milk base. Medicinal: antiseptic, antibacterial, anti-inflammatory, moisturizing and good for overall heat conditions of the skin such as inflammation,eruptions and excess oil. Mainly Pitta reducing, but can be neutral to Kapha and neutral to Vata. cooling and alterative; moisturizing. Mainly Pitta reducing. VK neutral. Contains: bergamot and lime oils with wild flowers in an aloe base. Medicinal: calming, antiseptic, anti-infectious, hormonal support, antibacterial and anti-inflammatory; moisturizing. Pitta reducing. Contains: wild chamomile and clary sage with oats (for exfoliation) in a vegetable glycerine base. Medicinal: calming, soothing, pacifying to the nerves, supports hormones, anti-fungal, antibacterial; moisturizing. Vata reducing, Pitta balancing. Contains: vanilla and clary sage oils with calendula flowers in a vegetable glycerine base. Medicinal: anti-depressant, nervine, febrifuge, relaxing, supports hormones, anti-fungal and anti-bacterial. Vata/Pitta reducing. Contains: rose and lavender oils in a goats milk base with rose petals. Medicinal: balances the mind and nervous system, anti-septic, reduces scarring and anti-infectious; moisturizing. Vata/Pitta reducing. Kapha neutral. 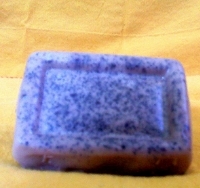 Contains: lavender oil and apricot kernal (exfoliation) in an aloe base. Medicinal: antiseptic, calming, soothes emotions and nerves; moisturizing and lubricating. Vata reducing, Pitta/Kapha neutral. Contains: turmeric, vanilla, cinnamon and nutmeg oils in a goats milk base. Medicinal: anti-bacterial, promotes circulation, reduces pain; moisturizing. Vata/Pitta balancing. Contains: Balsam Fir Needle in a goats milk base. Medicinal: evergreen scent that opens breathing, stimulates the spirit; moisturizing. Kapha reducing, Vata/Pitta neutral. Contains: vanilla, cinnamon, nutmeg oils with pumpkin puree in a goats milk base. Medicinal qualities: calming, yet stimulating, warming, anti-septic, improves circulation; moisturizing. Vata/Kapha reducing, Pitta neutral. Contains: pure coco and peppermint oil in a goats milk base. Medicinal: supports circulation, anti-oxidant, supports digestion, cooling, decongestant, anti-infectious and anti-bacterial; moisturizing. Vata/Kapha balancing and Pitta neutral. Contains: cinnamon, cardamom, ginger, nutmeg, clove oils and black tea in a goats milk base. Medicinal: anti-bacterial, anti-infectious, expectorant, slightly astringent, increases circulation, antispasmodic; moisturizing. Vata/Kapha reducing. Pitta increasing. Note: all soaps have Vitamin E added. Vitamin E is great for skin rejuvenation, regeneration and repair. Additionally, Goats Milk soap base is safe for Kapha due to its slightly warming nature, yet moisturizing for both Vata and Pitta.